The Santa Barbara County Public Health Department is issuing a warning to the public to avoid consuming raw fish and raw shellfish caught close to ocean waters where bacterial levels continue to be elevated, such as Goleta Beach and Carpinteria State Beach. People doing recreational fishing from a pier or boat close to beaches where oceans waters have exceeded bacterial standards should be aware that eating uncooked or undercooked seafood products could expose them to bacteria. These bacteria can cause illness if ingested. The Public Health Department will continue to test the beach ocean waters and update our community when new results are available. Ocean water testing, and this warning about consumption of recreationally caught fish and shellfish, will be lifted when bacterial levels decrease below standards. The Santa Barbara County Public Health Dept. is issuing a warning to the public to avoid consuming recreational harvested raw shellfish caught in ocean waters where bacterial levels continue to be elevated. Ocean water testing since January 11 has shown markedly elevated levels of coliform bacteria along beaches from El Capitan to Carpinteria. 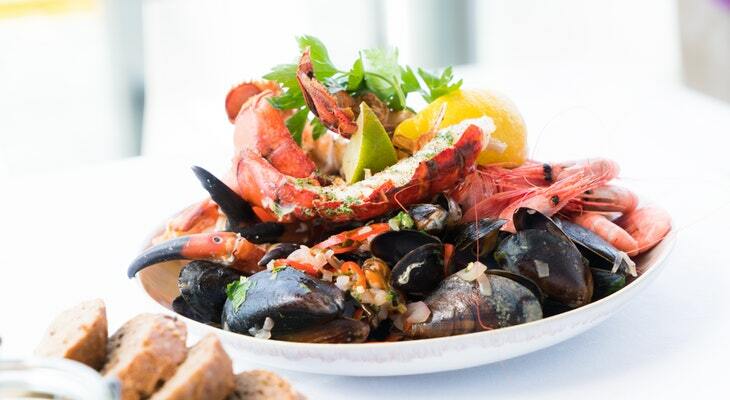 The public is reminded to cook all locally caught seafood thoroughly before consumption, especially molluscan shellfish which are filter feeders and concentrate contaminants. Ocean water testing will continue and this warning about consumption of recreationally caught shellfish will be lifted when test results warrant. The flipside of this statement is that beyond the piers and beaches surrounding the closed beaches, it IS safe to eat local seafood. As long as you cook your seafood, it will be safe to eat. Note that all commercially caught seafood is caught far beyond these areas, most of it miles from the coast, and is unaffected by the beach closures. Aside from the risk of bacterial illness, people may be concerned about toxins in the mud being dumped. It would take far, far greater concentration of toxin release to make it into local seafood at levels that would be detectable. Our local mussel farm is getting clean test results from its weekly testing and is prohibited from selling mussels if test results aren't 100%, so there is no danger there. All and all, its great that the County is working to ensure people have the facts about what is safe and not safe about using coastal waters!